I don’t remember the exact situation I was in when I first saw the face, but I was surprised. I was playing Doom on a crappy Dell computer at the time. I was no older than 10. What was that? Why did the Doomguy look like he had just stepped on a LEGO brick with his bare foot? I don’t even know if that was the first time I saw it or just the first time I was able to notice his small face change into something I didn’t know about. Years later, I found out what this face is, why it is so rare and how it works. In the classic Doom games, the player can see their health, ammo and armor on a status bar located at the bottom of the screen. Also included on this bar is a small face which is a visual depiction of the Doomguy. As you take more damage, the Doomguy gets covered in blood. The face will also smile and look around as you play. It even changes if you activate the god mode cheat, gaining glowing yellow eyes. Most players will see a lot of these different faces as they play through Doom. However, the ouch face is rare and when the game first was released, players weren’t sure what was happening. Many weren’t even seeing it. Some believed it was a totally random occurrence. However, once Doom’s source code was released by id Software in the late 90s, players discovered what was going on. The ouch face is so rare because of a programming error. 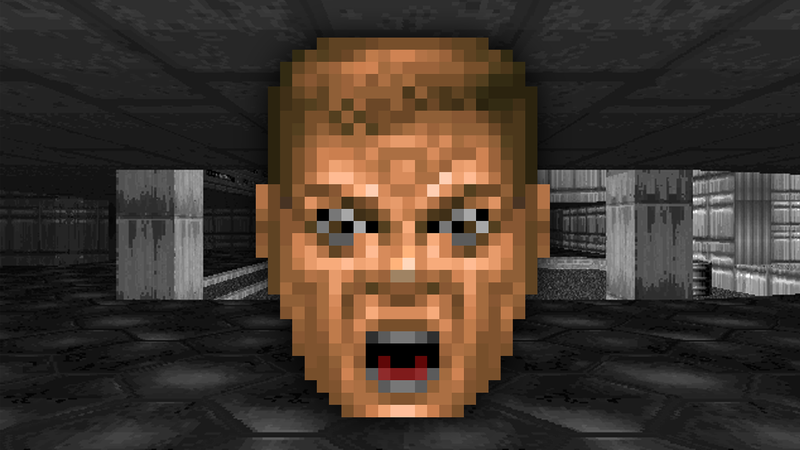 Players found in the code that the face should show up whenever a player takes more than 20 damage, which isn’t a very rare event in Doom. But the code controlling when the face appears was written incorrectly. Instead, the face only shows up when the player gains 20 health or more while at the same time taking damage. This is much rarer, usually only happening when a player picks up a large health item while getting attacked by more powerful enemies. There are ways to easy see the face. One of the most reliable ways to see the ouch face is to stand on a floor that does damage and then enter the god mode cheat code, iddqd. After doing this, the player gains more than 20 health while taking damage and results in the ouch face popping up. The ouch face has become a bit of meme in the years following Doom’s release. For example, it can be found in Doom 3 on an in-game magazine. In various ports of Doom the ouch face has been made easier to see. In the Playstation 1 port of Doom, the ouch face commonly occurs when the player takes damage from behind. Some source ports like ZDoom have actually fixed the bug, making the face appear more often in gameplay.